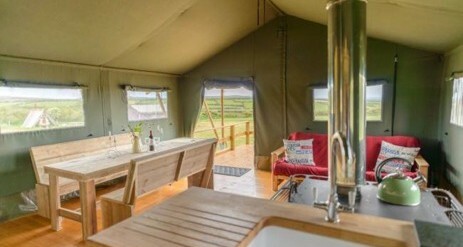 Boswarthen Farm glamping near Penzance, Cornwall offers glamping in an Area of Outstanding Natural Beauty, with stunning views of the sea, St Michaels Mount and the Lizard. Cornwall has it’s beautiful scenery and incredible coastline, many stunning beaches, sunrise AND sunset – all available in a short distance from Boswarthen. We are a conventional working dairy farm with our Holstein Fresian herd, ponies, chickens, ducks and a couple of sheep. Our milk is sold to DairyCrest to make Cathedral City and Davidstow cheddar. 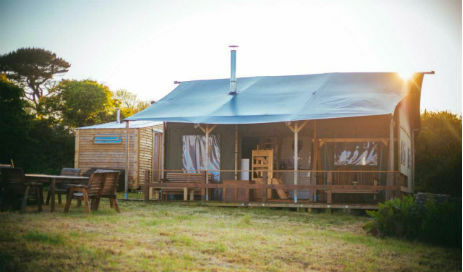 We have a choice of accommodation – a two storey safari tent with a hot tub and shower shed, five safari tents and a gypsy caravan which comes with a bell tent. Our tents are a stylish and practical, with its own toilet. The veranda is perfect for relaxing on a swing seat, watching the children make friends or the sea view. 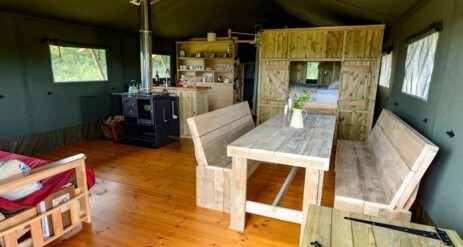 The main area is spacious with a kitchen area complete with gas hob, woodburning stove (with oven), a dining table with six chairs, a sofa and an insulated chest for your chilled items. The main bedroom has a king size bed, there is also another bedroom which contains bunk beds as well as a ‘cupboard bed’ which is enough space for two people (it has a 4’6” mattress). The toilet at the rear also has a hand basin. This unique tent is perfect for two families, bringing grandparents or a group of friends. Downstairs has a living space, a kitchen, a woodburning stove (with oven), a dining area, a Jack and Jill cloakroom and two bedrooms each containing a kingsize bed, a veranda provides you with a fantastic view of St Michael’s Mount and the Lizard Point. Upstairs there is an open plan sleeping area with four single beds. 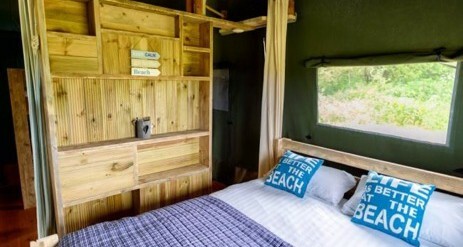 The Lodge also has a shower shed, which has its own shower, an extra toilet and hand basin. New for 2019 is a wood fired hot tub. 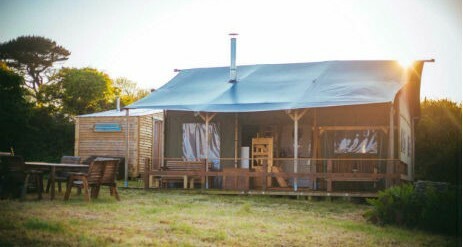 Our gypsy caravan is situated in the same field as our tents. It is placed in a secluded spot but doesn’t exclude you from all that goes on (unless of course you prefer it that way). You will have a fabulous view of St Michaels Mount. 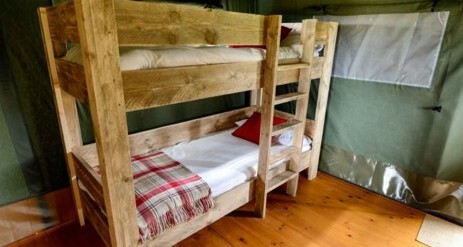 A Bell tent is sited next to the wagon making it ideal for older children, this has a wood burning stove and beds, we can also fit a travel cot in here. 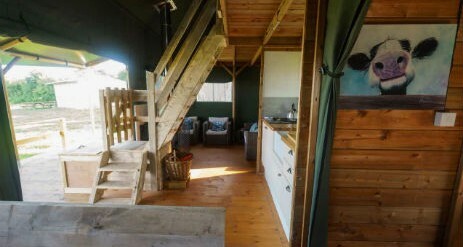 A cooking shed has all the pots and pans as well as a gas hob and your own private toilet is close by. With all the amenities this accommodation is perfect for a romantic or family getaway. We are delighted when our guests use our shop as we offer good quality local produce at competitive prices. It is not possible to compete with the supermarkets but we believe in asking a fair price as we do not like to be ‘ripped off’ ourselves. Our beef is from our own herd and all other meats are from a butcher who is supplied by local farms so no added water! The most incredible beaches in this Country are here, there are too many to write about but whether it’s surfing, sailing, wild swimming or sandcastles then this area has it all. If you prefer to be away from the crowds then we have small beaches and beautiful coves too. We are very lucky to be situated between two coasts. We have the north coast with it’s dramatic views and rugged rocks (where Poldark is filmed) or the south coast with its warmer breezes and pretty flowers. The moors have their own mysterious atmospheres and ancient stones. In fact Lanyon Quoit and Men An Tol are within walking distance and on Boswarthen we have the Wishing Well and Celtic Chapel. St Michael’s Mount and the Minack Theatre both described as iconic, are unique (thankfully)to this area. St Michael’s Mount probably the most famous of Cornwall’s landmarks, is steeped in both legend and folklore. The Minack Theatre is an open air theatre built into the granite at Porthcurno (the most popular beach with all my guests) and performances run from May to September (booking essential)with very popular children’s performances in school holidays.Of course there are many other days out and things to do, all within a short distance of Boswarthen. Should you wish to stay in Rosie – there is a minimum stay of 2 nights, the price is for a couple per night and any addition persons are charged at £10 pppn.